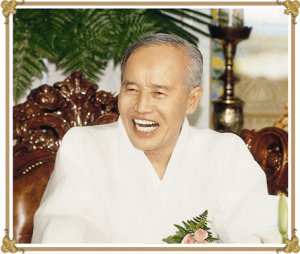 After the liberation of Korea, the second revival period was opened by Ahn Un-san, His Holiness the Taesang Jongdosanim. 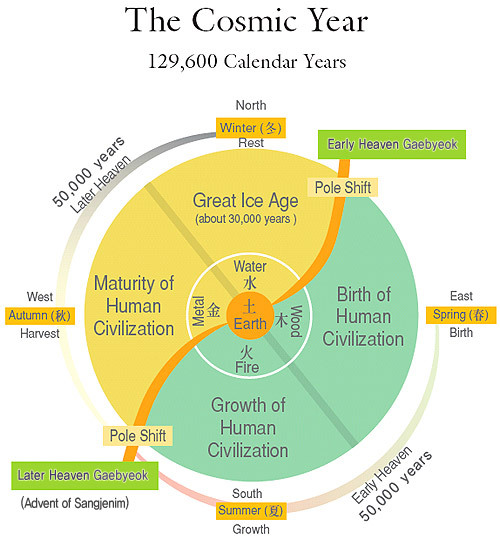 In 1946, the Taesang Jongdosanim drew the diagram of the Cosmic Year and declared it to humanity for the first time in history for the sake of enlightening the ordinary people to the truth and allowing anyone to easily understand the frame of principle of Sangjenim’s Dao. This one piece of the diagram is the final conclusion of enlightenment to the cosmic philosophy and history of human civilization. This diagram is amazingly lucid in teaching about the advent and new era. 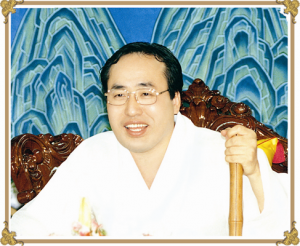 Succeeding this history, Ahn Gyeong-Jeon, His Holiness the Jongdosanim, currently the highest leader of Jeung San Do, has pioneered the third revival period of Dao affairs. More than thirty years of extensive research and fieldwork, His Holiness the Jongdoanim Ahn Gyeong-jeon compiled the written and oral testimonies of Sangjenim’s and Taemonim ’s disciples, the disciples’ descendents, and the disciples’ students and published the textbook [Dojeon]. This is the most important message that the True Eastern Learning, Jeung San Do, has been conveying. The approaching time of Gaebyeok is when the universe, civilization and humanity will be reborn. Gaebyeok is the message of hope that humanity will encounter a new world. Jongdosanim’s mission of disseminating the teachings had led him to give numerous lecture tours throughout the Globe. Today, he heads the effort to globalize Jeung San Do by training teachers and sending them to other countries and by guiding translations of Sangjenim and Taemonim’s teaching in 9 different languages, including English, French, Deutch, Spanish, Russian, Chinese, Taiwanese, Indonesian and Japanese. This is the historical background of Eastern Learning and the True Eastern Learning that continues to pave the pathways for the culture of spirituality of the Taeeulju Mantra, and the culture of TaeIl. Jeung San Do preaches the culture surrounding the Taeeulju Mantra to the world by revealing the primordial culture and essence of spiritual culture. Jeung San Do, the True Eastern Learning, is not a religion; it is a new spiritual movement that introduces the new daily life culture which all humanity should enjoy in the time of Cosmic Autumn. That is why Jeung San Do (甑山道) is also called Mugeukdaedo (無極大道) “the Supreme Dao of Mugeuk.